The 2017 Organized Retail Crime (ORC) Survey, an annual survey conducted by the National Retail Federation, continues to show the impact that organized crime is having on the business of retail. 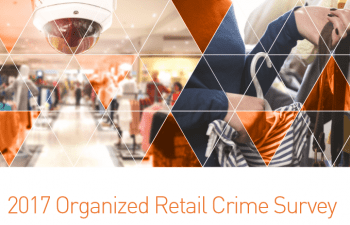 Each year the study explores the many ways that organized retail crime continues to grow and evolve based on input from retailers across the country, detailing new challenges and persistent issues that retailers face. It also explores resources and policy changes implemented to combat organized retail crime. According to the 2017 study, organized retail crime is once again on the rise, and those involved in ORC incidents are showing an increased propensity towards violence. More than 25 percent of retailers reporting that those involved in organized retail crime are exhibiting a greater tendency towards violent behavior. Yet according to respondents, knowledge surrounding the issue and resources to help fight ORC remain minimal. Resources are down as other areas of the business are demanding greater attention by retail executives. With competing priorities in the retail business this year, only 20 percent of respondents believe that top management fully understands the complexity and impact of the ORC problem, and 62.3 percent of companies said they have no loss prevention employees that are focusing primarily on ORC issues. All of this directly points to the need for increased awareness and educational opportunities related to the problem. According to the 2017 study, shoplifting including organized retail crime is the top source of inventory shrinkage for the second straight year, outpacing employee theft, administrative errors and other forms of shrink. ORC criminals look for items that can be stolen and quickly resold. As a result, there is a decided preference to steal products that include a mix of high-end luxury items and everyday commodities. 34 states now have ORC laws in place, however many retailers cite state legislation changes that are made to reduce prison populations, such as Proposition 47 in the state of California, that they believe have directly resulted in increased retail crime. Thieves that keep up with the laws know value limits in order to avoid felony charges if caught. This, among other issues, has led to 70 percent of responding retailers believing that federal organized retail crime legislation is needed. As the retail business evolves, so does the need for improved skill sets and improving internal talent at every level of the retail business. Loss prevention is certainly no exception. Ultimately, this will demand both greater focus and broader perspectives from those that serve the industry. Expectations for the future loss prevention team may include more employees with loss prevention as part of their job description, while their overall role may include many additional responsibilities. By the same respect, it is the responsibility of every retail leader to remain keenly aware of those issues that have the greatest impact on the business. Read the full report: National Retail Federation’s 2017 Organized Retail Crime Survey.